Lower extremity compartment syndrome is a devastating complication if not rapidly diagnosed and properly managed. The classic symptoms of compartment syndrome can be deceiving as they occur late. Any concern for compartment syndrome based on mechanism, or the presence of pain in the affected extremity, should prompt a compartment pressure check. Both absolute compartment pressures above 30 mm Hg and a pressure differential of less than 30 mm Hg are used to make the diagnosis. The treatment goal is first to save the patient’s life and second to salvage the affected limb. Fasciotomy is the only accepted treatment of compartment syndrome and should be performed quickly after the diagnosis is made. Outcomes after fasciotomy are best when there is no delay in treatment. Lower extremity compartment syndrome is not uncommon and has the potential to cause devastating morbidity for patients and a high-risk medical-legal environment for physicians. Rapid diagnosis and prompt, accurate treatment lead to the best outcomes. The sequela of compartment syndrome left untreated was first described by Volkmann in 1881. His landmark article detailed ischemia to a limb that when left untreated for several hours led to paralytic contracture.1 The prevailing theory at the time was that tight bandages caused the ischemic insult. Bywaters and Beall better2 defined the disease of compartment syndrome in a case series of British World War II victims in 1941. Labeled initially as a crush injury with impairment of renal function, the authors describe a swollen limb developing into shock, diminished pulse in the injured extremity, impending limb gangrene, progressive renal failure, and ultimately death. This was further elucidated and better characterized by Carter et al3 in 1949 as muscle trauma leading to increased pressure within a muscular compartment that impairs blood supply, leading to necrosis. No comprehensive accounting of the prevalence of acute lower extremity compartment syndrome has been published. In part, this is secondary to the many different causes and descriptions of the disease process. It has been estimated that the average annual incidence is 0.7 per 100 000 women and 7.3 per 100 000 men.13 Roughly 2.8% of patients who sustained extremity trauma will require a fasciotomy.9 When Farber et al14 analyzed the National Trauma Data Bank for patients sustaining lower extremity arterial trauma, the number requiring fasciotomy rose to 41.7%. A delay in the diagnosis of acute compartment syndrome can have devastating consequences for the patient. Early suspicion of the disease should invoke an immediate response. The classic signs of acute compartment syndrome include the 6 ‘P’s’: pain, paresthesia, poikilothermia, pallor, paralysis, and pulselessness. Pain is usually the initial complaint and should trigger the workup of acute compartment syndrome. All patients at risk should have early and frequently repeated physical examinations to assess for pain in the muscle compartments. A clinical diagnosis of compartment syndrome can be followed by prompt surgical decompression; however, the diagnosis is often unclear, and pressure monitoring is commonly required. Because of its subjective nature, although unlikely, the absence of pain cannot negate the possibility of compartment syndrome. Several case reports describe patients with acute compartment syndrome who never experienced pain.18 19 Paralysis, pulselessness, and parasthesias present late in the disease process, often after irreversible nerve and muscle damage, and should not routinely be part of the diagnostic criteria for acute compartment syndrome. For both evaluable and non-evaluable patients, pressure measurement is invaluable in the diagnosis of compartment syndrome. In a landmark 1975 article, Whitesides et al21 introduced the concept of compartment pressure as a diagnostic tool. Because the presentation of compartment syndrome can vary drastically with each patient, compartment pressure provides an objective data point with which to make a clinical decision. Whitesides followed his original article with a detailed description of his technique.22 In his method, an air pressure system is created by connecting a mercury manometer to intravenous extension tubing and a needle, which is inserted into the muscle compartment. A minute amount of saline is injected into the compartment, which transmits air pressure to manometer, and a compartment pressure is obtained. In contemporary practice, a commercially available device such as the Stryker system is often used. After being zeroed, the needle is inserted perpendicular to the skin, then into the muscle compartment in question. 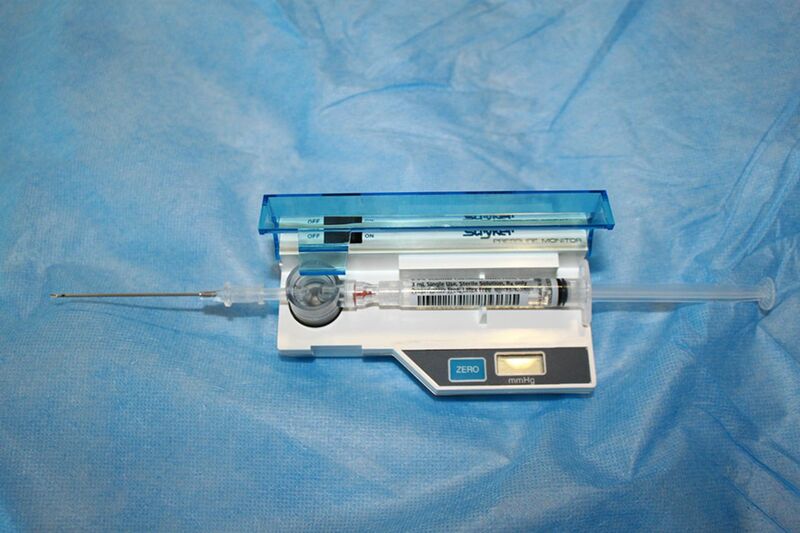 A total of 0.3 mL of sterile saline is injected through the needle into the compartment. Equilibrium is reached in a few seconds, and the compartmental pressure is then read on a digital screen (figure 1). If the Stryker system is not available, a pressure transducing system, like that used for an arterial line and similar to Whitesides’ original description, can be used. It is of utmost importance to measure all muscular compartments, not only the compartment thought to be at highest risk. In the below knee leg, all four compartments must be checked, even though the anterior compartment has the highest risk of compartment syndrome. A common pitfall is to assume that a patient with an open fracture has already decompressed. However, patients with open fractures are at risk of developing compartment syndrome.9 Because compartment syndrome is a dynamic process, even if the initial compartment pressure is normal, it is imperative to repeat frequent examinations and pressure checks to not delay the diagnosis. Although we do not advocate this, some groups have described using a single incision fasciotomy to decompress all four compartments of the lower leg.39 40 In this approach, the skin incision is made laterally between the tibia and fibula. The anterior and lateral compartments are entered in the routine fashion. The superficial peroneal nerve is retracted anteriorly, and the posterior intermuscular septum is found inside the lateral compartment. The superficial posterior compartment is decompressed by incising the posterior intermuscular septum. The deep posterior compartment can be entered via the anterior compartment by retracting the tibialis anterior laterally and incising along the lateral tibia, through the interosseous membrane.39 A retrospective case series has shown no difference in deep infection rate, bone nonunion, and length of follow-up between patients with tibial fractures receiving either a single or dual incision fasciotomy, although this study did not evaluate for missed compartment syndrome requiring repeat fasciotomy.40 Further literature on the single incision fasciotomy technique is very limited. At the index operation, if non-viable muscle is encountered, it should be debrided. Any questionable muscle can be re-examined at a planned second look operation within 24 hours from the index operation. Multiple techniques can be used for closing or dressing fasciotomy wounds. 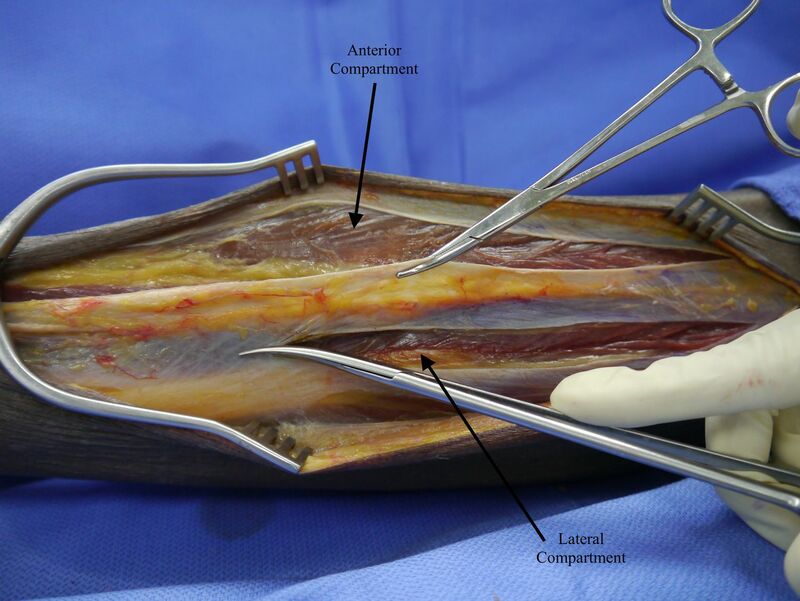 Immediately after a fasciotomy, it is advisable to use a loose, non-constricting dressing to allow the muscle to fully expand, especially if there is ongoing resuscitation. Kerlix or gauze dampened with sterile normal saline should be placed over the wound, covered with abdominal pads, and lightly covered with additional kerlix. After the index operation, both traditional wet-to-dry dressings and tension-based dressings, such as a shoelace technique or a vacuum-assisted-closure dressing, can be used. The goal with any type of fasciotomy dressing is to facilitate delayed primary closure of the wound. There is evidence that the use of a vacuum-assisted closure dressing is associated with significantly higher rates of primary closure than traditional dressings.42 Conversely, Kakagia et al found that patients who received a vacuum-assisted closure dressing had a significantly longer time to wound closure than patients who received a shoelace technique.43 Vacuum-assisted closure dressing was also associated with significantly more expense than the shoelace technique.43 Patients that receive split thickness skin graft early in their course have a significantly shorter length of stay than patients treated with traditional dressings.41 It is clear that with lack of consensus in the data, at this time much of the decision regarding the fasciotomy dressing will rest with the culture of the institution and the preferences of the individual surgeon. Unfortunately, complications after fasciotomy are not rare. Nearly one-third of patients receiving fasciotomies will end up with a postoperative complication: soft tissue necrosis, wound dehiscence, skin graft infection or necrosis, or need for tissue debridement.34 Underlying vascular injuries leading to fasciotomy are associated with a significantly higher rate of complications than patients without vascular trauma.34 When Feliciano et al35 evaluated a large series of compartment syndrome that led to amputation, 75% were associated with a delay in appropriate treatment. 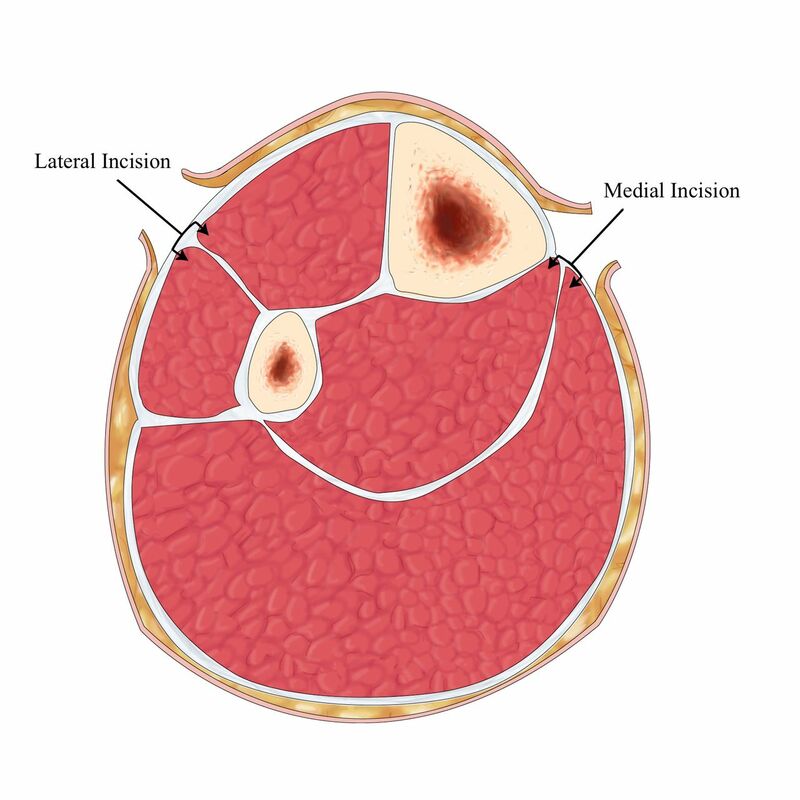 One of the biggest pitfalls surrounding fasciotomy for compartment syndrome is missing or inadequately opening a compartment. A missed compartment is a critical technical error as irreversible muscle and nerve may damage occur. In a study of military patients, Ritenour et al37 showed that the need for a fasciotomy revision was associated with significantly higher rates of muscle necrosis and fourfold increase in mortality. Postoperatively, the patient must be frequently examined and the creatine kinase (CK) levels followed. Failure to clear CK or any other concerns of a missed compartment must trigger immediate re-exploration. Vigilance is key when evaluating and treating patients with lower extremity compartment syndrome. The classic signs of compartment syndrome, the ‘6 P’s’ can be deceiving. If there is any concern for compartment syndrome, especially when a patient has pain out of proportion to an injured extremity, compartment pressures should be checked immediately. Fasciotomy is a simple, straightforward treatment that is highly effective if performed early.
. Die ischaemischen Muskellahmungen und Kontrakturen. Centralblatt fur Chirurgie 1881;51:801–3.
. 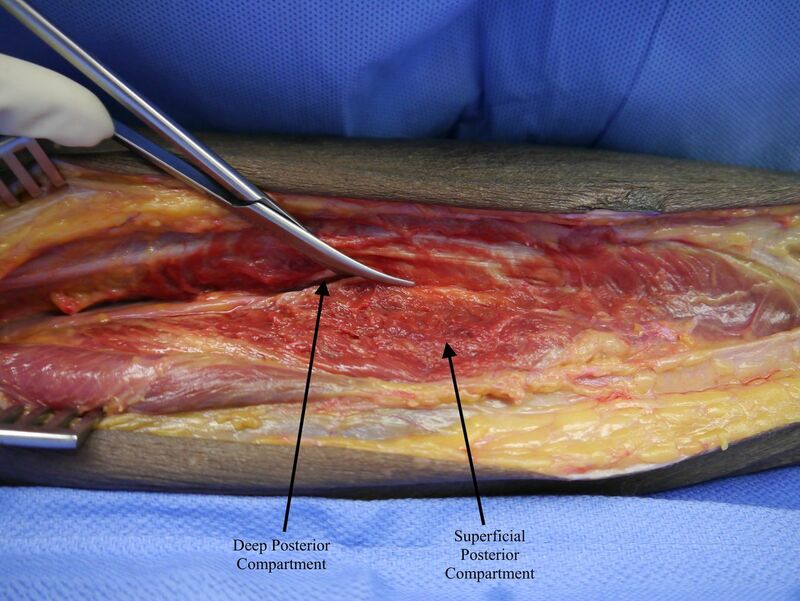 The pathophysiology of the anterior tibial compartment syndrome: an experimental investigation. J Trauma 1978;18:299–304.
. Muscle injuries and repair: current trends in research. J Bone Joint Surg Am 2002;84-A:822––32.
. Acute compartment syndrome. Who is at risk? J Bone Joint Surg Br 2000;82:200–3.
. Tibial compartment syndrome complicating closed femoral nailing: diagnosis delayed by an epidural analgesic technique--case report. J Trauma 1994;37:867–8.
. Monitoring of intramuscular pressure. Surgery 1976;79:702–9.
. Compartment monitoring in tibial fractures. The pressure threshold for decompression. J Bone Joint Surg Br 1996;78:99–104. Contributors JC wrote the article. KI organized, reviewed, and edited the article.